The importance of empowering students to not only be involved in the political process but also to share their ideas about how we can improve public policy and put those plans into practice is critical, as the solutions to our nation’s biggest challenges will undoubtedly come from our next generation of leaders. I can say for certain after visiting with students across the district last week − from elementary to high school – that our future leaders will surely hail from our corner of the world. I am continually inspired hearing how schools in the 7th District are raising the bar for excellence, and that’s certainly true for the folks at Lanier High School in Sugar Hill, who I had the honor of congratulating on receiving the 2018 Green Ribbon School Award. Since 2012, the U.S. Department of Education has given this award to those schools that engage in environmentally sustainable practices and educational programs as well as health and wellness initiatives, and Lanier High was one of five educational institutions in our state to receive this distinction. During my visit, I got to view first-hand the hard work that led to this recognition, including a walkthrough of their STEM program where I got to see these bright young minds work with 3-D printing, laser engraving, and robotics. Lanier High’s commitment to project-based learning through its STEM program, along with its campus recycling and waste reduction initiatives, campus gardens, and more signals how its team of educators and impassioned students are leading the way in our state, and I am grateful for these students’ willingness to go even further and achieve more. What’s more, I also had the opportunity to visit with over 100 4th grade students at Puckett’s Mill Elementary School in Dacula as well as middle and high school students and faculty at Notre Dame Academy in Duluth to discuss my role in Congress and the importance of getting young people involved in government. While I know there are those who think young people today are apathetic to current political issues, I don’t think that’s true in our community. In fact, my visit to Notre Dame Academy is a perfect example. It was through the efforts of Rohan Soni, a 10th grade student at Notre Dame who got his fellow students engaged in political issues, invited me to speak, and even moderated the discussion! From questions on bipartisanship to what a typical day in Congress looks like, it is clear that these students, both those who have years of schooling ahead of them and those who are nearing their transition to college and the workforce, have a passion for ensuring that government is responsive to them. Our community stands above the rest because of this spirit for learning, and it is exciting to hear their questions and ideas. These school visits always lift both my spirit and my expectations. I hope that my sharing them does the same for you! 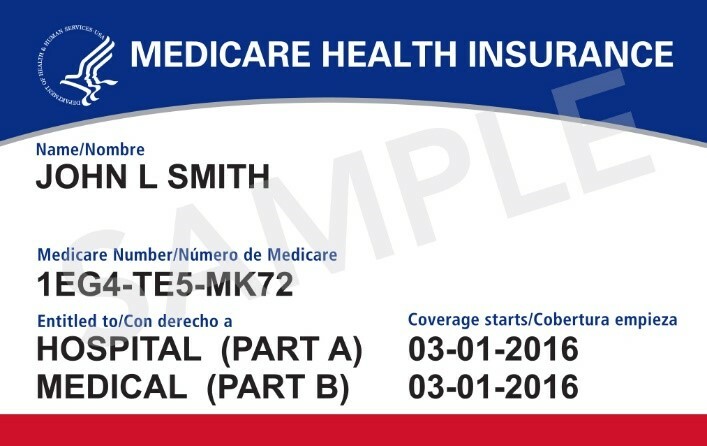 Last year, the Centers for Medicare and Medicaid Services (CMS) announced that Medicare beneficiaries would receive a new Medicare card this year that does not display the beneficiary’s Social Security Number (SSN). The new cards are an effort to protect seniors from identity theft and to safeguard taxpayer dollars by trying to eliminate fraud. And the great news is that CMS has completed its roll-out of the new cards to Georgians, and as such, all Medicare beneficiaries in the state of Georgia should have received a new card with a new Medicare Beneficiary Identifier (MBI) by now. The MBI is what you’ll use for Medicare transactions like billing, eligibility status, and claim status instead of your SSN like you once did. Once you receive your new card, be sure to destroy your old card safely so that your personally identifiable information cannot be obtained by others. You can learn more about the new Medicare cards and what to expect by clicking here. If you or a loved one did not receive a new card, or if there is an error on the card, please do not hesitate to call my office at 770-232-3005 to speak with a member of my staff who will be more than happy to assist you. No American should be put at risk of identity theft at no fault of their own, and I commend CMS for undertaking this endeavor in such a timely manner! If you’ve ever met with me or have seen me speak at events across the district, you will know that by far one of my favorite things to do as your representative is brag about the countless successes and opportunities I get to see every day here at home. I am so incredibly fortunate to represent a district full of individuals and companies big and small who are job creators and innovators. This past week I had the pleasure of seeing two more examples of that. The first was with a company we all know, Amazon. This past September, Amazon opened a new 75,000 square foot delivery station in Lawrenceville. At this new station, more than 400 part-time and full-time employees work to get your Amazon packages through what is called the “last mile” – from the delivery center to your front door. Not only is this facility offering opportunities to those working directly for Amazon, but it is also empowering small businesses in our community – like local delivery companies – that employ even more people by providing access to Amazon’s logistics services. The only thing more exciting than the number of job opportunities coming into our district are the number of ideas coming out of it. The second company I had the opportunity to meet with this week was ScanTech, which is doing some great work over in Buford that may change your airport experience for the better. ScanTech showed off what will be the next generation of baggage scanners with their Sentinel III machine that will improve both the speed of our airport security process and the safety of our flying experience. Their new scanner can detect more threats more quickly and is already being used in two major airports. As the only small business to have qualified for TSA’s next generation of X-Ray scanners, ScanTech is competing against some of the largest companies in the country. I am proud that ScanTech has decided to call our community home, and I thank them for their hospitality. One of the many achievements this Congress shares with the Trump Administration is the elimination of duplicative and overly burdensome regulations levied on nearly every industry in the United States. The deregulation agenda began almost on day one of the 115th Congress, and for the past two years, the White House’s continued diligence has yielded billions in savings, with $23 billion of those savings achieved this year alone! As noted by the Office of Information and Regulatory Affairs’ Fall 2018 Unified Agenda of Regulatory and Deregulatory Actions, I’m proud to say that this administration has worked hard to keep and strengthen those regulations that are absolutely necessary for the safety and wellbeing of the American people while ridding us of those that are simply outdated and ineffective. And that has resulted in reduced paperwork for nurses, better access to care for our nation’s veterans, and improved health insurance options for small businesses to provide for their employees, among so much more. You may recall that when President Trump took office, he set out to cut two regulations for every newly issued regulation. His administration hasn’t done that. It’s done so much more! In fact, the White House announced last week that we have actually eliminated 12 regulations for every new one issued. We have achieved a great many things over these past two years with President Trump at the helm to expand economic opportunity and improve business optimism, but there’s so much more to do. For as long as you entrust me with your voting card, we will continue our great work here in Washington and ensure our nation’s economy reaches its fullest potential. When the governing process fails to function, reform is necessary. Congress has taken a step in the right direction with the establishment of a new committee to fix the congressional budget process but more must be done. Congress must build on this effort and consider more fundamental reforms to its procedures, processes and political behavior. This is why I urge you to take this next step and endorse the establishment of a Joint Committee on the Organization of Congress. This committee should be tasked with examining the institution of Congress from every angle, searching for ways to enable bipartisan cooperation, and empowering members to better share their constituents’ voices. It will commit to return to more effective legislating, establishing a strong balance of power, and demanding responsible governance. I feel like we can’t talk about politics or large issues without offending, alienating, or hurting people with different opinions than the majority. This is an issue because it reduces the conversation aspect of politics where we need to discuss problems with our peers or elected officials to find the solution that pleases everyone. What are you doing or what could you do to reduce the political divide in America? Like Maria and Stephen, I am dedicated to finding real solutions to our nation’s problems and less worried about which side came up with the idea or who gets credit for it. Whether by crafting laws like the Veterans Expanded Trucking Opportunities Act, which I wrote with Representative Julia Brownley (D-CA), protecting Georgia’s water resources with the bipartisan Georgia delegation, or by being selected by House leadership to be one of only four Republican House members on the bipartisan, bicameral Joint Select Committee on Budget and Appropriations Process Reform, I have made a name for our community in Congress as a leader who is willing to work with others to make the hard choices the American people expect. That partnership does not mean sacrificing my values or principles, but rather, it demonstrates that I am willing to listen and talk. The better news, though, is that I am not alone in this effort. Constituents are not the only ones who think Congress doesn’t work. Many new members of Congress arrive with that same expectation. Even new members of Congress are surprised by how serious their new colleagues are about their work and how dedicated they are to fighting for their constituents. Despite what you might hear on the news from talking heads or even from politicians themselves, members of Congress are willing to come together every day to pass bills with bipartisan support to keep America running. In fact, the Pew Research Center found last year that the 115th Congress has been one of the most productive in years, and since that study, we have only achieved more, and that does not happen on accident. As of October 1st, the House has passed 1,011 bills, 279 more than average, and 245 of those bills have been enacted into law, including important laws that reform the VA, establish first-in-a-generation tax reform, and in one of the best examples of bipartisan legislation, the National Defense Authorization Act (NDAA), protect our national security. Arguably, the NDAA is one of the most important laws Congress passes each year to authorize our national defense programs, and for fifty-eight consecutive years, Congress has put aside our differences and partisan squabbles to ensure that our country is safe. While it’s true that Americans are more ideologically split now than in the past, I do not believe representative government is broken, and I am proud to be your representative in Washington working to overcome the rhetoric that divides us. There is no doubt that Americans disagree and will continue to disagree on issues big and small. But, I am equally certain that there is more that unites us as a nation than divides us. As long as citizens remain willing to participate in the American experiment in self-governance, we will all have common ground to work from to better our entire nation. When you can point to a half century of dedicated, remarkable service to your community as one of your life’s achievements, well, that’s just inspiring. 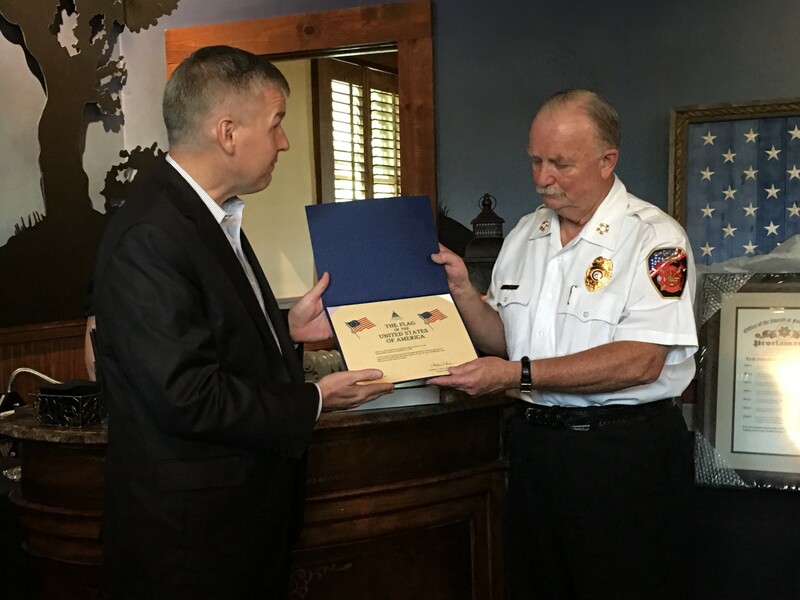 For Forsyth County Fire Chief Danny Bowman, that is exactly the legacy he created over the span of his outstanding career in public safety and service. You don’t get a community like ours without individual leaders like Chief Bowman. They are the pillars of what we’ve built here at home. Last week I had the pleasure of joining friends and neighbors as we celebrated his great example, and it was my privilege to present him with an American flag that had been flown over the U.S. Capitol in his honor. Chief Bowman is a humble man, but his love for serving others is as evident as the positive impact he has had on Forsyth County. Like so many who know him, I have tremendous respect for Chief Bowman, and I wish him the very best in retirement! I’m grateful for his service, and I look forward to seeing our next great leader flourish in this vital role. It’s often said that small businesses are the backbone of our economy not only here at home, but all across the country. That couldn’t be more true, and these “risk-takers and visionaries,” as Gwinnett Chamber of Commerce President and CEO Dan Kaufman described them, are leading that charge. Their growth and success is directly correlated to the success of our community as a whole. Through hard work, long days and nights, and an unrelenting commitment to their dream, they turn those dreams into reality. We are so fortunate to have a robust and thriving small business community in the Seventh District, and I’m grateful to our local leaders, chambers of commerce, and more for their commitment to supporting them. Just last Wednesday, the Gwinnett Chamber hosted its annual Pinnacle Small Business Awards luncheon, and as is always the case, it was full of outstanding local businesses spanning all kinds of industries. They should all be proud. I’m certainly grateful for their drive and passion and what they bring to our community. One of the most rewarding aspects of serving as the Seventh District’s Representative in Congress is being able to visit with and learn from these business owners, including the winner of the 2018 Pinnacle Overall Gwinnett Small Business of the Year Award and the Small Business of the Year: 25+ employees, Winton Machine. George and Lisa Winton founded their business from their home more than 20 years ago and have since built their operation into a world-renowned manufacturer, innovator, and local job creator. They have represented Georgia at the Made in America Showcase at the White House, been recognized by the Department of Commerce with the U.S. Commercial Service Export Achievement Award, had their expertise sought after by numerous industries throughout the years, and now they add the Pinnacle Overall Small Business of the Year Award to the list of well-deserved accolades. Having had the opportunity to get to know the Winton team over the years, I couldn’t be happier to see their continued success. As I’m sure they would tell any prospective or new business owner with a dream, with hard work there’s no limit to what you can accomplish here in our community. To all of the Pinnacle finalists and small businesses across the district, thank you for what you do, and please don’t hesitate to reach out to me if I can ever be of service. Early voting has begun in Georgia, and in the first week, hundreds of thousands of our friends and neighbors have already gone to the polls. Our state and local election officials know how difficult it can be sometimes to get to the polls on Election Day, so from now until November 2nd, voting locations in Forsyth and Gwinnett counties will be open every weekday, and on Saturday, October 27th, locations will be open for folks who would rather vote on a weekend. Whether you decide to vote early or vote on Election Day, I hope that you avail yourself of your right to vote. It’s a right that Americans fought and died to protect, and it’s a right that so many around the world living under authoritarian regimes are denied. Our American government – from city halls to the halls of Congress – functions best when we’re all part of the process, and that begins with voting. You can CLICK HERE for a list from the Secretary of State’s office of polling locations in Forsyth Country, and you can CLICK HERE for a list of locations in Gwinnett County. I hope that you and your family have a great week and enjoy this beautiful fall weather. Thank you for the honor of serving you.